Allow yourself the “freedom to fail”. When a multi-billionaire pioneer like Mark Zuckerberg speaks, people definitely take note. 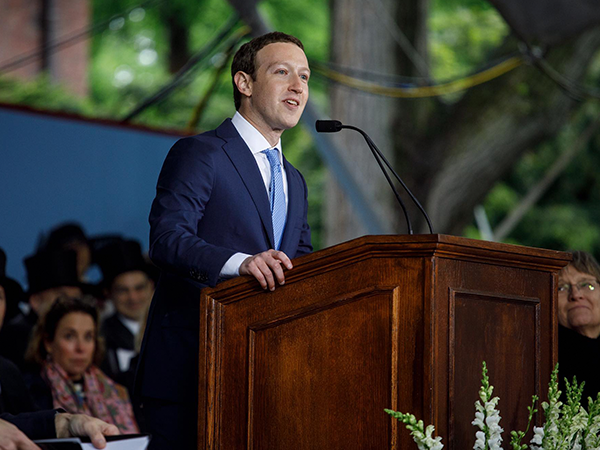 This was the case again recently when the Facebook boss addressed young graduates at Harvard University, where he was awarded an honorary doctorate. The 33-year-old American, apparently the youngest keynote speaker ever at the top institution’s graduation ceremony, also finally got capped – 13 years after dropping out from the same university to devote himself full-time to opportunities in online business. Mark talked to students about how to approach the business world, what real success requires and how they should try to make the world a better place for everyone. “Purpose is that sense that we are part of something bigger than ourselves, that we are needed, that we have something better ahead to work for. Purpose is what creates true happiness." Mark related how an adviser tried to persuade him in the early days of Facebook to sell the company. “He told me if I didn't agree to sell the company right then, I would regret that decision for the rest of my life." Within a year after he’d made the tough decision to hold on to his passion project, just about every member of his original management team quit. “I believed in what we were doing, but I felt alone. And it was my fault. I wondered if I was just wrong... Now, years later, I understand that that is how things work when there's no sense of higher purpose." Apart from himself, he also used Beyoncé as an example. “She had to make hundreds of songs to get Halo. And JK Rowling got rejected 12 times before she finally wrote and published Harry Potter." "Ideas don't come out fully formed. They only become clear as you work on them. The idea of a single ‘eureka moment’ is a dangerous lie. It makes us feel inadequate since we haven't had ours. It prevents people with seeds of good ideas from getting started." “But be prepared to be misunderstood. Anyone working on a big vision will get called ‘crazy’. Anyone taking initiative will get criticised for moving too fast, because there's always someone who wants to slow you down." “When you don't have the freedom to take your idea and turn it into a historic enterprise, we all lose. Right now our society is way over-indexed on rewarding success and we don't do nearly enough to make it easy for everyone to take lots of shots. We can all make time to give someone a hand. When more people can turn their dreams into something great, we're all better for it."